Since the past recent years, mobile apps have been changed constantly. And because of their enormous popularity and usefulness, they serve to be a significant opportunity for appreneurs as well as enterprises. Smartphones have fully dominated the life of people. There is hardly any individual in the world who is unaware of the features and uses of smartphones. People spend maximum hours of their day using smartphone apps and features like listening to music, reading news, sending official reports and a lot more. Among the users of a mobile phone, the maximum users are youngsters below the age of 30 who use mobile phones for doing texting and calling. With the increasing usage and the need for mobile phones also increases the development of mobile applications. The mobile app development has forced the companies to think of better and innovative ways to meet the growing demand for smartphone users. AMP will change the web scenario: Google's AMP is under process in the current year. With this project, Google will bring a separate index on the mobile web. With this, there will be a great change and advancement in the development of a mobile application. This results in faster loading on smartphones and a reduction in the bouncing rates. Also, it will offer better and improved visibility, thus increases the number of visitors. Thus, with the AMP feature, there will be trending changes in both web application and SEO standpoint. AR and VR will play a more significant role: You must be aware of VR and AR, the top two trending technologies that are gaining popularity in the gaming and entertainment industry. Some of the AR-enabled popular games are Pokemon Go, Sky Siege, etc. While the Oculus Rift, Google Cardboard Samsung Gear VR is gaining popularity in the VR. This technological feature will be the momentum phase and play a significant role in the year 2019. AR will move ahead of VR and find numerous applications in training workforces in big businesses. So the year 2019 is going to bring a better experience in terms of AR and VR technology in the year 2019. Real Experience of AI: Artificial intelligence is under accelerated growth since 2017 and will play a powerful role in 2019. This has prompted many industries and top companies like Facebook, eBay to acquire startups expertise in AI and machine learning. The apps with features like Siri, Google Now and a lot more will rise to further advanced by the end of 2019. Cloud-enabled mobile apps: Everyone is now familiar with cloud technologies, these days and with time it has gained a significant position in the tech world. The mobile and web development companies tend to bring high-quality and advanced functional mobile apps that help in bringing data directly from the cloud thus occupying minimum space on the mobile device. Better version of micro and enterprise apps: With enterprise, mobile application companies are able to streamline, reset structure and in managing the critical day to day processes. Many companies find such apps to be highly beneficial and are tending to use and integrate them into their organization. IoT will become important: The Internet of Things will become a trending feature of the fast adoption of cloud-based apps. This will come out to be more trending in the year 2019. 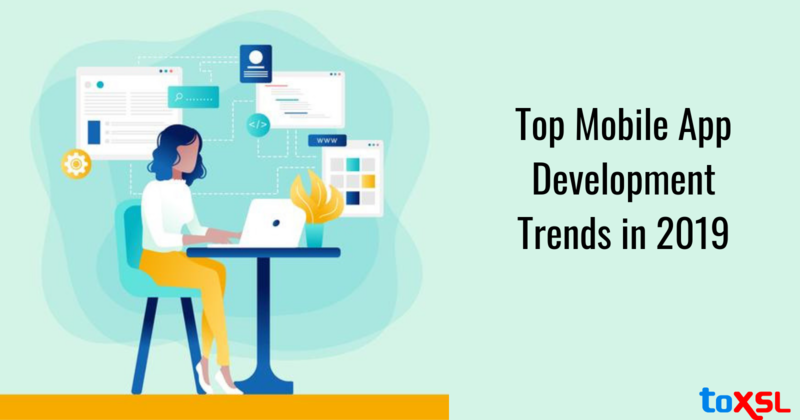 There are the top trends in the mobile application development that we are going to see in the year 2019. To make such predictions or trend in reality it is important for the web and mobile app development companies to rely more and more on modern technologies. Why we use Mobile Application Nowadays?